As long as man has desired to fly, there have been attempts to re-create the wings of birds strapped onto the backs of men. Most, unfortunately didn't fly at all, and the few that did more often than not crashed hopelessly soon thereafter. It wasn't until the late 1800s when serious study of the principals of flight gained popularity that wings strapped onto a human began to enjoy some success. Notable designs were developed in Germany, in Australia and in the USA. The first truly stable and manipulable hang gliders were commercially developed after the USA's National Aeronautics and Space Administration devoted several millions of dollars to research a wing for the recovery of satellite pieces. With the research published, hang gliders enjoyed a resurgence in the US, and by the 1960s commercially available outfits were developed. 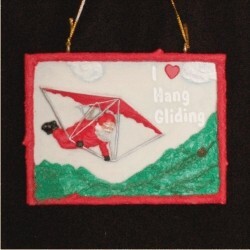 Difficult to find, we have one hang gliding ornament to offer. If you choose, we can personalize it as a gift to your favorite glider enthusiast.